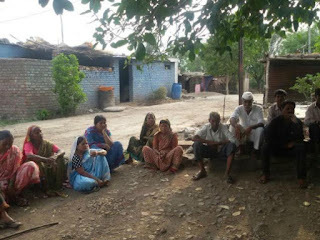 Facing a social boycott from upper castes and fearing possible violence, all 13 Dalit families of Ansurda village in Osmanabad in Maharashtra have written to District Collector Prashant Narnavre seeking rehabilitation near an urban area. Mr. Narnavre said the administration would ensure the safety of the Dalits and see to it that their constitutional rights were not violated. On April 28, the Dalits took out a procession to mark the birth anniversary of Babasaheb Ambedkar, where songs dedicated to the Dalit icon were played. “A few upper caste youths objected to it and demanded that we play songs on Shivaji Maharaj. We played those songs too,” Nishikant Humbe, one of the Dalits from the village, told The Hindu. The young men desecrated the image of Dr. Ambedkar and abused Dalit women, according to a police complaint filed by the families. The police arrested four youths, of which two were minors. “The fact that we filed a complaint enraged the upper castes and they called for a social boycott,” said Bibhishan Avadhute, another villager. Ansurda, with a population of over 1,500, has only 13 Dalit households — 11 of Buddhist Mahars and two of the Mang community. The Dalits were asked not to drink water from public taps and their cattle was barred from grazing in the village. Shopkeepers were asked not to sell groceries to them. Despite the continuous boycott for over 12 days, no case has been filed under the Scheduled Castes and Scheduled Tribes (Prevention of Atrocities) Act. “On the contrary, all the arrested four came out on bail,” Mr. Avadhute said. While the boycott was officially called off on the Collector’s intervention, the situation remains unchanged. “We are still denied groceries from shops. Members of the upper castes have put saffron flags everywhere to threaten us. The police deployed by the Collector do nothing but watch. We want to shift somewhere safer,” said Sushma Sonawane, another villager from Ansurda. The families are living in fear of a possible attack by the upper castes. The District Collector accepted that the social boycott had created tensions. “But we will not allow anyone to violate the constitutional rights of citizens,” Dr. Narnavre told The Hindu. “All the accused in the case have been identified and the law will take its course,” he said. The Jaati Atyachar Ant Sangharsh Samiti, an action committee against caste atrocities, said it would approach Chief Minister Devendra Fadnavis demanding that the provision of the Act be invoked against those behind the social boycott.